If my recent blog post "Blastocystis aux Enfers" could be described as "Blastocystis meets Dante Alighieri", then this post might come across as "Blastocystis meets Sir David Attenborough" (with all due respect to both of these gentlemen!). Non-human primates (NHPs) include apes (hominoids), Old World monkeys (cercopithecoids), New World Monkeys (ceboids) and prosimians such as lemurs. I have been so fortunate to be involved in a study of Blastocystis in NHPs; a study which was led by Dr Alfellani with several co-investigators, and which has just appeared online in the journal Parasitology (click here to be diverted to the the website - first view article section). The study is the first of its kind aiming to provide a substantial insight into the host specificity of Blastocystis in NHPs and included subtype observations for 441 captive and free-living animals representing no less than 30 genera; most of the data were generated during the study, while sporadic observations from similar studies were also included. It was a huge study with a lot of interesting information, and I will try and summarise some of the points here. Apes such as bonobos, chimps, gorillas and orangutans were colonised by some of the most common subtypes in humans, namely ST1, ST2, and ST3, accounting for about 77% of the cases. Contrary to humans though, ST5 also appeared rather common, accounting for about almost 14% of the cases, and some of the gibbons studied had ST8. Interestingly, a chimp and a gibbon were found to be hosts of a new subtype, ST15. Old World monkeys were studied to an even larger extent, and again, ST1, ST3 and ST2 predominated, accounting for about 95% of all cases of single subtype infection. Here ST5 was also seen (2%) but only in langurs/lutungs and vervet monkeys. Interestingly, ST8 was seen only in 1/226 cases. ST13 was found by colleagues in Tanzanian colobus monkeys (Petrasova et al., 2011), and 8% of the 226 cases represented mixed/unknown subtype infections. New World monkeys included in the study were mainly represented by woolly monkeys, and these were colonised first and foremost by ST8 (49%), but ST3, ST2, ST1 were also found. So was a single case of ST4, which in general appears to be surprisingly rare among NHPs. A few observations on lemurs were included, and such animals appear to host a vast variety of subtypes with no particular predilection, hence ST1, ST2, ST4, ST8, ST10 and ST15. Ring-tailed lemur (Lemur catta) (Source). The most striking differences between humans and NHPs in terms of colonisation by Blastocystis subtypes is that humans are very rarely colonised by ST5, while this subtype appears common in apes and Old World monkeys. ST8 was seen only in arboreal apes and in woolly and howler monkeys, which are also tree-dwellers, and it is tempting to think that ST8 is found mainly in tree-dwelling NHPs; to my knowledge, ST8 has not been found in non-primate hosts, except for once in a bird. Human colonisation by ST8 has been demonstrated only very rarely, for instance in a Danish woman returning from holiday in Indonesia and in animal keepers. Conversely, ST4 is seen extremely rarely in NHPs, while very common in humans in some parts of the world, apparently especially in Europe. These clear discrepancies in subtype distribution in humans and NHPs may boil down to host specificity and/or apparent geographically restricted range of some subtypes. Another striking observation was that cryptic host specificity exists in ST1 and ST3, meaning that ST1 and ST3 strains found in NHPs overall differ genetically from strains found in humans belonging to the same subtypes, adding support to our previous findings.This suggests that humans are generally colonised by other strains than those found in NHPs. It will be interesting to see, whether other types of hosts sharing these subtypes carry distinct, host-specific strains. While MLST is probably the best way of testing for this, a lot of information can be obtained simply by barcoding. Pets, for instance, may share subtypes seen in humans, and so barcoding of "pet blasto" may be one of the very interesting pathways to knowledge. We found no evidence of those subtypes that we have nicknamed "avian subtypes", namely ST6 and ST7. In some parts of the world, these two subtypes do not appear uncommon in humans; in Denmark and Sweden, for instance, ST7 is seen on quite a few occasions. But, interestingly, both STs are apparently absent in NHPs. 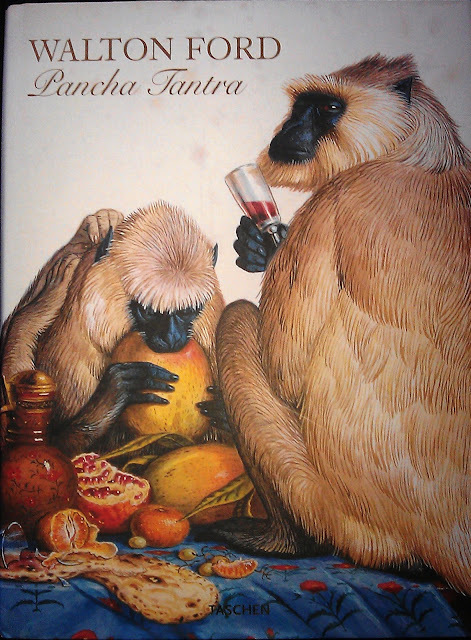 Langurs - the front cover of one of my favourite books showcasing works by the magnificent Walton Ford. Incidentally, there is a sequence in GenBank from a gorilla (JX159284) which possibly represents a novel subtype, which is related to reptilian Blastocystis, and so it appears that the host spectrum and diversity of Blastocystis in NHPs continues to unfold. A recent study saw that faecal microbiomes of wild non-human primates co-vary with host species, hence reflecting host phylogeny. This was evidenced by higher intra-species similarity among wild primate species, which may reflect species specificity of the microbiome in addition to dietary influences. This may in part explain the differences in Blastocystis subtypes seen in different NHP host species, but it is also possible that differences in subtypes reflect differences in habitat (and thereby possibly exposure) or geographical differences in subtype distribution. Indeed Homo sapiens is host to a variety of subtypes, and while ST4 is common in Europe, it appears virtually absent in many other parts of the world. Likewise, the differences in the prevalence of ST8 may reflect differences in geographical distribution, habitat and diet (arboreal vs. ground) as well differences in host specificity. The overall interesting thing here is the schism of exposure vs. host specificity.